Jack Bell Gallery is pleased to present a group exhibition of portraiture by six West African photographers. The show focuses on the regions of Mali and Republic of Benin and includes both vintage and recent prints. Shot between 1960 to present, the majority of these images will be exhibited in the UK for the first time. 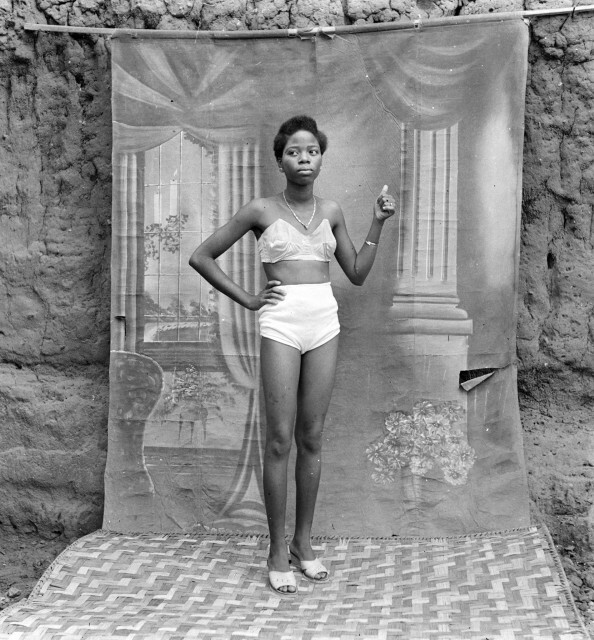 At a time when many West African countries were gaining independence, studio photography became an important aspect of expressing and redefining local identity. Common amongst all the photographers in the exhibition is the practice of capturing their fellow countrymen on film, attired in their finest clothes, often holding props against carefully chosen backdrops. Their stylized poses and expressions suggest they were engaging directly with the photographer and the camera lens. The photographs give an insider’s viewpoint and an optimistic insight into self-determination. Born 1932 in Burkino Faso, Hamidou Maiga first established himself as a photographer working around the River Niger in the late fifties and early sixties. As well as villagers in their finery, a swathe of dignitaries, accomplished artists, musicians, sportsmen and religious authorities frequented Maiga's studio. Many of his subjects were being photographed for the first time. As well as forming an outstanding record of Malian society, Maiga achieves a strict sense of formality and a remarkable level of intimacy with his subjects. In 1973 Maiga opened his first studio in Bamako. These unique images reflect both his client's subjectivity within the community and their enthusiastic embrace of modernity. The photographs of Pigeon Studio Voyageur, Ouidah, and Dainoun Maiga, Bamako, also convey a sense of freedom and confidence in a young urban population. Dossa Cosme had his studio in Porto-Novo, but often travelled to remote villages to photograph people in transition between traditional life and a more progressive world. His subjects included ju-ju men and voodoo priests and priestesses, but also the elderly for whom photography was likely to play a role not just in life but also in the afterlife. It was a commonly held belief in Benin that a person’s soul lives on after death, trapped within the photograph. Leonce Raphael Agbodjelou is one of the pre-eminent photographers of the Republic of Benin. Born in Porto-Novo in 1965, he was trained by his father, the world-renowned photographer Joseph Moise Agbodjelou (1912-2000). Leonce’s ongoing portraiture project, 'Citizens of Porto-Novo,' captures the people of Benin’s capital.